Here at Sword & Laser, we love encouraging people to try writing for themselves, even if it's just during NaNoWriMo! But the Alpha SF/F/H Workshop is helping many young writers, ages 14-19, learn their trade with the help of volunteers at their yearly workshop in Pittsburg. But they need our help! Writing genre fiction can be a lonely business for teens. The Alpha SF/F/H Workshop brings together young writers, aged 14 to 19, for ten days of creation and peer review critiques. At the end of the workshop, students leave with new skills and a vibrant network of support. Alphans have published in dozens of markets, including Lightspeed, Clarkesworld, Analog and Strange Horizons. Many of them have placed and won in contests such as The Dell Magazine Award, Writers of the Future, and the Scholastic Art and Writing Awards. Tamora Pierce, author of young adult series such as Protector of the Small and The Provost's Dog, has instructed at the workshop every year since its inception. This year, instructors include Ellen Kushner, author of the beloved Riverside books recently adapted into an award winning Audible series, Delia Sherman of Freedom Maze fame, and Andre Norton-award nominee Alaya Dawn Johnson. Alpha works hard to keep costs low--every staff member is a volunteer, and the tuition is kept at the lowest possible level--but prospective students often require financial aid. This year--as they have for the past several--alumni have contributed writing and art to an illustrated flash fiction anthology and offered it as a donor reward in the entirely alumni-organized scholarship fund drive. The Alpha alumni fundraiser will run March 17-26. Would you consider giving us a signal boost? Donations really do change the course of our young writers' lives. To learn more about the Alpha SF/F/H Young Writers' Workshop, please visit the Alpha website, and check out our latest video, featuring interviews with Bruce Coville and Tamora Pierce. Congrats to the Nebula Award winners! This past weekend, Josh Lawrence and I went down to San Jose for the Nebula Awards. While there, we interviewed several attendees, including Kim Stanley Robinson, Gene Wolfe, and Joe Haldeman. Those interviews will be coming up as podcasts soon, so stay tuned! 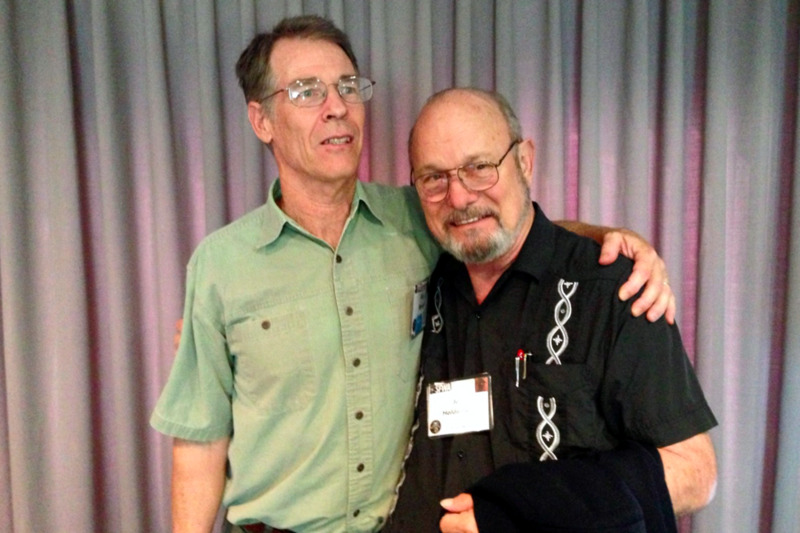 Best Novel winner Kim Stanley Robinson with Joe Haldeman. In the meantime, let's congratulate the winners of the 2012 Nebula Awards!, as posted on Tor.com! Winners in bold. 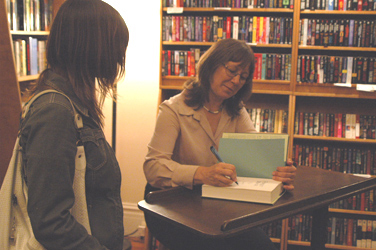 Solstice Awards were awarded to editor Ginjer Buchanan and astronomer and entertainer Carl Sagan, the latter of which was accepted by his son Nick Sagan. The Kevin O'Donnell Jr. Service Award was awarded to Michael Payne. The winners are announced at SFWA’s 48th Annual Nebula Awards Weekend, held Thursday through Sunday, May 16 to May 19, 2013 at the San Jose Hilton in San Jose, California. Borderland Books hosted the mass autograph session from 5:30 p.m. until 7:30 p.m. on Friday, May 17th at the San Jose Hilton. As announced earlier this year, Gene Wolfe was the recipient of the 2012 Damon Knight Memorial Grand Master Award for his lifetime contributions to, and achievements in, the field. Founded in 1965 by the late Damon Knight, Science Fiction and Fantasy Writers of America brings together the most successful and daring writers of speculative fiction throughout the world. 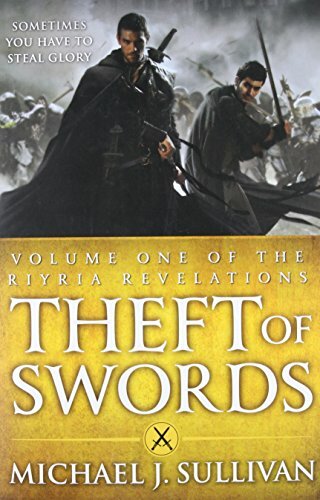 As listeners of the podcast know, both Tom and I are big fans of Joe Abercrombie, and especially of The First Law trilogy. So when I found out that Joe was working on a new graphic novel based on Logen Ninefingers and his (mis)adventures (from the man himself, no less) I immediately wanted to learn more. Joe was kind enough to answer a few questions about the series, which you can learn more about at First Law Comic. First off, congrats on the graphic novel! That's very exciting! It's been a long time in the pipeline - maybe 18 months since the deal was first signed - so it's great to see it go out into the world. Who first approached you to make The First Law into a graphic novel? Rich Young from Blind Ferret, who also edited, put the artistic team together and brought in Chuck Dixon to adapt. What interested me in particular about Rich's pitch, quite apart from his creative vision and his love for the books, was Blind Ferret's track record with webcomics and digital distribution. Had anyone else come to you wanting to do that before, or was that something you had considered on your own? I'd had a couple of much more traditional approaches, but the traditional comics market is pretty small and steadily dwindling, and obviously crowded with a lot of very powerful and long-established brands, I just didn't see a traditional approach getting enough momentum to make the work worthwhile. Will this be a print edition, or digitally distributed? Both? And what will the release schedule be like? It was the method of distribution that really sold this idea to me. In essence there's a triple approach. Firstly we're going to be serialising the adaptation, free to all comers, at www.firstlawcomic.com. The first twelve pages have gone up already, and there'll be new pages posted every monday, wednesday and friday, hopefully for several years to come, given that this is a pretty detailed and comprehensive adaptation. I just right away felt that, with free distribution, there was the potential to create a lot of goodwill and get a lot of people through the door and involved with it, and that it was potentially a good thing for the books as a whole. But for those who aren't satisfied with a page at a time and want to get a little ahead of the game, we're also going to be distributing whole issues, for between 99 cents and $2.99, via ComiXology, which will come with guided view and a package of inks, pencils and designs as a bonus with each issue. One of the great things about reading is the ability to visualize your favorite characters. How do you feel about nailing down the descriptions of the characters on the comic page? Have they ended up the way you pictured them in your head, and did you have input on that for the graphic novel? Someone was foolish enough to offer me total editorial control, but I've tried to take a reassuringly firm yet lovingly gentle touch with it. I think when you work with an artist you need to give them the freedom to draw it the way they see it, to let them interpret the work the way they want to. And as a writer you don't always have entirely vivid pictures of every character and location. So some designs were perfect right off. Others were surprising, but fitted. Others needed some tinkering with. But generally, Andie Tong, the artist, has an amazing eye for costume and location design, and I've really been able to say yes, yes, yes to a lot of things and let him produce his vision of the books, given extra verve and variety by Pete Pantazis' colours. So there'll certainly be some things that keen readers of the trilogy will see differently, but as a whole it's an adaptation that I'm very pleased with and hugely proud of. Obviously the story needs to be trimmed down for this manner of storytelling. What was that process like? How do you pick what makes the cut? Rich brought in Chuck Dixon, who's a hugely experienced comics writer, to do the adaptation. He's obviously got a great sense for what to pick out from a scene, what to show and how, what angles to use to get the action across. But obviously I know the books and the characters better than anyone, so I'd go over each script in some detail trying to keep as much sense of the books and the voices of the characters as possible, and maybe changing something here or there that would be important long term. It's going to be a detailed adaptation, 16 issues for the Blade Itself alone, so it hasn't been necessary to really lose that much in terms of whole scenes. it's amazing how much prose you can boil down into one carefully designed panel. In general the whole process has been quite an education for me. One that will continue for some time to come. Do you have any plans to make any of your other books into comics? Season One of S&L Video coming to an end! The S&L studio team does jazz hands. As many of you may know from the most recent audio podcast, the video edition of S&L is coming to an end (for now). Huge thanks to Geek & Sundry for making the whole thing possible, for our friends at Pixel Corps for the production and post-production services (and for being awesome in general), and to Fonco Creative for bringing our set (and Lem) to life! Tom and I are looking into new ways to keep the show alive going forward, so don't fret! 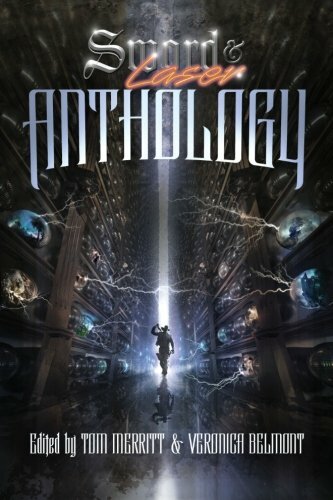 We have our hands full right now will getting the anthology off the ground, but we promise you we're working on it. Episodes of the video show will continue through the end of March, and you can always keep up with the book club on Goodreads and the audio podcast! The BIBLIO-MAT is not people! Podcast listener Jacob wanted to let us know that there aren't actually people passing out the books from within the Biblio-Mat in Toronto. It's actually... automated! With mechanisms! And such! I don't know who this woman is, but she's wearing one of our new t-shirts! You can buy them here over on /loot, and thanks to the wonderful Scott Johnson for hosting them! We've been talking about it for years, but now it's actually going to be a real thing! That's right, we're officially announcing the Sword & Laser Anthology! 1. We're looking for unpublished, new material. 2. Genres: science fiction, fantasy, and everything in between. 3. Word count preferably between 1500-7500 (though more or less will not disqualify you). DON'T SEND US ANYTHING YET! We won't even LOOK at it until we announce the open call. Just start thinking about what you'd like to submit. We wanted to give you some warning, but you'll have time, we promise! Good news, everyone! The Sword and Laser Wiki is live! As with most wikis, this is open for anyone to edit, and a lot of work has already been done on the book list and glossary page, but chime in if there's anything else you'd like to add! Also, did you see the amazing art Scott Johnson made for us for Nerdtacular '12? He's the best, as we'll be there recording a live audio show! So Tom and I are looking for someone in the community to lend a helping hand around the farm. We'd like to hire (YES, HIRE) a production assistant to help us with guest booking, asset gathering, event coordination, and other tasks. We need someone who is extremely detail oriented, available around eight hours a week, and obviously has a love of science fiction and fantasy! You don't need to be local to SF, though it would be easier if you were in a timezone that lent itself well to collaboration. Please email us at feedback@swordandlaser.com with the subject line "Production assistant." This will be a paying gig, though we cannot shower you in gold (sorry). Serious inquiries only, and don't fret if we don't get back to you immediately! Sword & Laser theme on ukelele! S&L listener Anne did an awesome cover of our theme music (originally composed by our pal Josh Lawrence) on her ukelele! How awesome is that? And she's only been playing the ukelele for three weeks! As you all know, HBO is doing a huge push for The Game of Thrones miniseries (YAAAAY!!) on The Maester's Path, an interactive website where you can solve puzzles to obtain exclusive early looks and info about the show. The third puzzles came out this week, and it deals with a very important task: defending the Wall. Join me here, and discuss the puzzles on our GoodReads page. We're working on a fix for why the full podcast listings don't show up with our old theme (previously, you could only see the last ten or so podcast entries). We're also migrating our feedburner stuff, so if you see anything wonky, let us know in the comments!